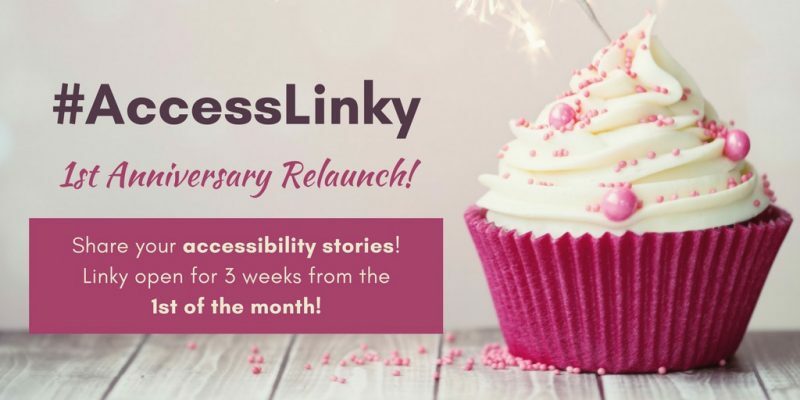 My monthly accessibility stories blog link-up! I’m hoping this will turn into a helpful informal tool to enable an exchange of ideas and experiences (good and bad!) of the accessibility (physical, sensory and social) of buildings, places, spaces and products, and to spread the inclusion message much further than our lone voices can! I welcome input from anyone that is affected by accessible and inclusive design – users, carers, friends and family as well as designers, developers, managers and legislators – so pretty much everyone then! The linky will open on the 1st of the month (however posts don’t have to be written that month, or indeed new!) and will remain open for 3 weeks. Depending on the number of posts linked, I’ll write up a little round up/summary or pick out a few highlights of the previous month’s entries when I post up the next linky. The lovely Rainbows Are Too Beautiful has a really helpful Linky Guide (I use linky tools so the interface is a little bit different but the principles are the same). I’m really looking forward to reading some fab posts from friends old and new! Hop over here to find the most recent linky and to have a browse through the previous ones!